Ciudad Acuña, also known simply as Acuña, (originally Garza Galán, later Villa Acuña) is a city located in the Mexican state of Coahuila, at 29°19′27″N 100°55′54″W﻿ / ﻿29.32417°N 100.93167°W﻿ / 29.32417; -100.93167 and a mean height above sea level of 271 meters. It stands on the Rio Grande (locally known as the Río Bravo), which at this point marks the U.S.-Mexico border, and offers two border crossings via Lake Amistad Dam International Crossing and Del Río-Ciudad Acuña International Bridge with the neighbouring city of Del Rio in the U.S. state of Texas. It serves as the municipal seat of the surrounding municipality of Acuña. The 2017 estimate city population was 201,778 whereas the municipality's population was 214,616. The city is the fourth-largest in the state of Coahuila and the fastest-growing city in Mexico. The area is served by the Ciudad Acuña International Airport. The Del Rio-Ciudad Acuña Metropolitan Area (DR-CA) is the seventh-largest binational metropolitan area along the United States-Mexican border. 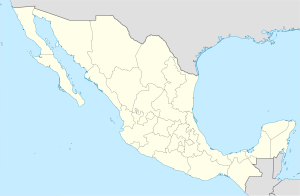 The city of Del Rio is situated in the U.S. state of Texas on the north side of the Rio Grande and Ciudad Acuña is located in the Mexican state of Coahuila south of the river. This metropolitan area is also known as "Tierra de la Amistad". The Del Rio Micropolitan Area's population was 55,000 people in 2015, and the Ciudad Acuña Metropolitan Area's population was 225,000 people in 2015. The 2015 population of Greater Del Rio-Ciudad Acuña Binational Metropolitan Area is 280,000. The first recorded settlement of Acuña took place on 27 December 1877. It was founded by a group of colonists led by Domingo Urias, Irineo Casillas Arevalo, and his wife Maximina Espinoza. At the same time, the governor of the state was general Hipólito Charles, who posted a military garrison in the area led by Captain Manuel Leal. In 1880, the community received villa (town) status under its first name of Garza Galán. In 1884, the locality was renamed Congregación las Vacas. Congregacion Las Vacas was then renamed Villa Acuña in 1912 after Saltillan poet Manuel Acuña. Villa Acuña was finally given the title of city on 16 September 1951 By Don Jesus, when it got its present name of Ciudad Acuña. On 24 October 1960, US president Dwight D. Eisenhower and Mexican President Adolfo López Mateos met in Acuña to sign the initial agreements allowing construction of the dam. Construction plans were not finalized until December 1966, when Presidents Lyndon B. Johnson and Gustavo Díaz Ordaz met on the international bridge. Presidents Richard M. Nixon and Gustavo Díaz Ordaz met for the dedication of Amistad Dam on 8 September 1969. Originally created to serve airmen at Laughlin AFB just across the border, "Boys' Town" is an entertainment district located in an area south of Ciudad Acuña and contains a few after-hours bars and brothels, but is designated off-limits to U.S. military personnel. On May 25, 2015, an F3 tornado struck the city, causing incredible damage and killing 14 people and injuring 200 more. In the 1930s in Villa Acuña, now Ciudad Acuña, the border blaster XERF-AM made its home. The radio station was built by Dr. John R. Brinkley from Kansas. Dr. Brinkley claimed to be able to cure male virility deficiency with goat gland transplants. Dr. Brinkley wanted to promote his male enhancement operations and used the radio station for that purpose. Because of the purpose of radio XER and what it promoted, the station was closed in 1939 by the Mexican government. In 1947, the government of Mexico licensed XER-AM, the super-power border blaster run by Ramon D. Bosquez on 100 kW. They used the old XERA facilities and sold its airtime to American evangelists broadcasting in English to the United States. In 1959, Ramon D. Bosquez and Arturo Gonzalez formed the Inter-American Radio Advertising, Inc. in Del Rio. They ran the broadcasting in Del Rio while the license rested in the hands of Mexican officials. They boosted the power to 250 kW. This super station was where famous disc jockey Wolfman Jack between 1962 and 1964 became known. XERF-AM is currently under control of the Instituto Mexicano de la Radio and plays Spanish-language programs and music. Acuña is referenced in a song called "Mexican Blackbird" on the ZZ Top album Fandango. "Blame It on Mexico", a song performed by George Strait and written by songwriter Darrell Staedtler on the "Strait Country" album tells about a night in Acuña at Ma Crosby's (a historic restaurant in Acuña) in the beginning. Acuña is the setting for the Robert Earl Keen song, "A Border Tale". Steve Earle references "Boys' Town" in his song "The Week of Living Dangerously", recorded as Steve Earle and The Dukes, on the Exit 0 album. "Acuña" is the title of a song recorded by Wade Bowen in October 2017. In the film, Rolling Thunder (1977), the villains are known as the Acuña Boys. Outdoor scenes for the 1992 cult motion picture El Mariachi were shot here, as well as the bar scenes and street confrontation from the sequel, Desperado. Actor/producer Carlos Gallardo was born in Ciudad Acuña. Also, Desperado and Single Action were filmed in Acuña at the Corona Club (cater-corner to Ma Crosby's) located on the main strip (La Hidalgo). In Kill Bill: Volume 2 the protagonist goes to see Bill's friend Estaban, who runs Acuña through the strength of his Acuña boys, the fatherless sons of the women he pimps. In another Tarantino movie, Grindhouse, Acuña Boys Mexican Food is featured on a bumper ad, as well as a take-out drink container in the first scenes of Death Proof. The film Like Water for Chocolate was filmed on Lake Amistad in Acuña. The film Love and a .45 features a standoff between the film's primary protagonists and antagonist in Acuña after the three have crossed the U.S./Mexico border. Portions of the film No Country For Old Men are set in Acuña. Scenes in the Western novel Ride Harder (2017) take place in Acuña and the town is mentioned in the series's first book, The Hardest Ride (2013). Various foreign companies have opened factories, or maquiladoras in Acuña, given its status as being 100% union-free. These include Irvin Automotive Products (automotive seat components), Bendix (brake and hydraulic parts), Gentherm de Mexico (automotive seat heaters), RESCO Electronics (wiring harness and cable assembly manufacturing), and Toter Incorporated (waste receptacles, curbside roll-out carts). ^ "Annual Estimates of the Population of Metropolitan and Micropolitan Statistical Areas: April 1, 2005 to July 1, 2012 (CBSA-EST2006-01)". 2012 Population Estimates. United States Census Bureau, Population Division. 2007-04-05. Archived from the original (CSV) on 2007-09-14. Retrieved 2007-04-09. ^ Cuevas-Nazario, Mayra. "Texas school district turns away students from Mexico." CNN. September 11, 2009. Retrieved on September 11, 2009. Wikimedia Commons has media related to Ciudad Acuña.